I ride because of my daughter! My name is Katie and I just started riding. I am really enjoying it. Lets go back to 2006. My 11 year old daughter was having some vision problems. She was diagnosed with retinitis pigmentosa an eye disease that is robbing her of her eyesight. She is now 16 and legally blind (she is amazing and doing well). What she sees is clear but is losing her peripheral vision and is night blind. When she was diagnosed we were devestated especially as we found out it was genetic. We made contact with the Foundation Fighting Blindness Canada (we live in Ontario Canada). The Foundation asked us to attend their big fundraiser Ride for Sight!It is a huge Motorcyle event that raises money for research. We were skeptical as we were not sure we were ready to be so open about out daughters problems and we were NOT bikers by any means. Well we are fighters and we went. It was amazing. Truly amazing. We went for several years and volunteered and enjoyed helping and meeting the coolest people ever. My husband eventually had enough of being the geeky guy going to the car when everyone else left on their bikes for the ride. He started riding and LOVES it. He is on his 2nd bike and now rides a Honda 1300 VTXR. Hubby told me I had better start riding or I was going to be left out. I am kind of type A tall at 5 10 and he knew I would hate riding on the back. He had a Yamaha 650 Silverado he wanted me to ride but I did not like cruisers, I found the seat too low and the front too heavy, so we sold it. I now own a 650 GSXF Suzuki which I love. We have another daughter who has normal eyesight. Comments for I ride because of my daughter! Katie, Thanks for sharing your story. 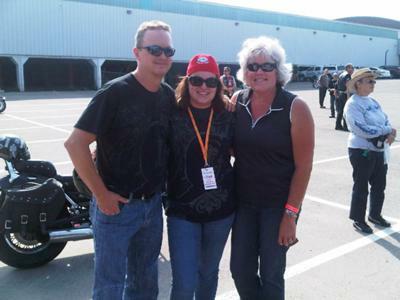 I always love to hear how people find motorcycles and the affect they have on their lives. Wonderful cause and I pray for an early cure in the future. P.S. Can you share your long legs with me? Mine are way too short and I'm dying for a real sport bike! What a great story and what a great cause. Thanks and my best wishes to your daughter and the whole family.